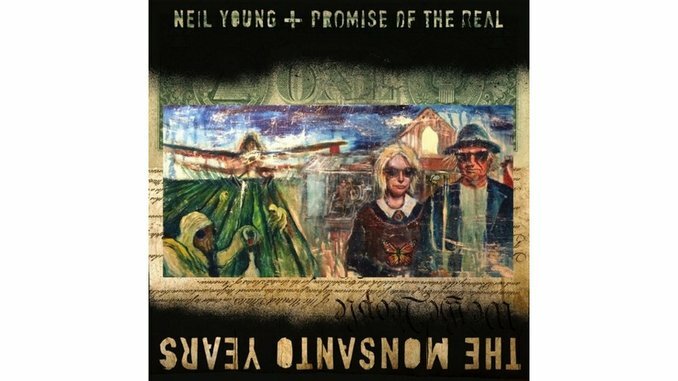 Neil Young isn’t afraid of controversy or pile-driving expectations. On The Monsanto Years, the iconoclast skewers economic deception, corruption of our food and the profit motive while offering evidence of why the raggedy rocker matters. “Big Box” echoes “Powderfinger” and “My, My (Hey, Hey),” surging electric guitar blasts pummeling a lyric that offers a sobering reality check about corporate justification and the demise of smaller economic bases. Chronicling the destruction of Main Street, rise of big business and betrayal of the average Joe, a zombie chorus sweetly intones, “Too big too fail/ Too rich for jail” as the song swerves into classic Young jamming. Working with Lukas Nelson’s Promise of the Real, Young’s urgency is infused with youthful intensity. The down-stroked hoedown “Working Man” channels “Are You Ready For the Country” a la cutlery in a blender. All punk charisma, it’s so ebullient one could almost miss the sobering tale of a seed-harvester arrested in the wake of Monsanto’s seed patents. Equally heavy, the wall of sound on “Rules of Change” evokes the Troggs’ “Wild Thing,” before pulling back to a spare beat-heavy consideration of the truths that outstrip corporate reality. Nature trumps all, as primal drums beat, guitars rise and Young’s broken plank tenor leans towards sweetness. Young is not just attacking Goliath. He tackles mass inertia with the sweeping “People Want To Hear About Love,” juxtaposing the titular sentiment with a laundry list of what they’re using romance to ignore: fish dying in toxic water, world poverty, corporate pay-offs, pipelines, Citizens United, pesticides’ link to autism. Tumbling issues whither the bromide of the device, making Young’s brazen politicizing seductive on a purely musical plane. And for all the glorious rock and blues, he evokes the organic “Harvest Moon”/”Needle & the Damage Done” aspect of his work. Opening with “A New Day for Love” and “Wolf Moon,” Young seeks contemplative places to spread his gospel. As “If I Don’t Know” closes The Monsanto Years, the soul search is wrung dry, the reckoning served loud and proud, jocular without letting the joke ever obscure the truth.